Q introduces himself to Kirk and the Enterprise crew, with a plan to show Kirk that there is such a thing as a real no-win scenario. The inside front cover of this issue features birth date information for Kirk, Spock, Uhura, Sulu, and Chekov. Kirk's birth info we already knew from "Rebirth". The others are: Spock, born 2230 on Vulcan; Uhura, born 2233 in Kitui, Kenya, Earth; Sulu, born 2237 in San Francisco, California, Earth; Chekov, born 2241 in Taganrog, Russia, Earth (in the original timeline, he was said to have been born in 2245!). Page 1 of this issue is a brief recount of events at the end of "Countdown" Part 4, which leads into "Rebirth". This issue opens in the original ST timeline, shortly after the Jellyfish and the Narada vanished at the end of "Countdown" Part 4. The character of Q that appears in this story arc was originally introduced in the ST:TNG episode "Encounter at Farpoint" and has appeared numerous times in stories set in that timeline. This is his first appearance in the new timeline. On page 2, Ambassador Picard orders from his cabin's food replicator, "Tea. Earl Grey. Hot," and Q pops in, chiding, "Would it kill you to try chamomile for once?" Picard has been known throughout the TNG era of stories for having a preference for Earl Grey tea. On page 4, Q is about to tell Ambassador Picard about differences in the alternate timeline created by Spock and Nero's interference in the past, and he brings up Khan Noonien Singh as an example. Picard stops him from saying anything further, but Q was presumably going to relate the events of the Khan mini-series and Into Darkness. The new timeline events of this issue begin on stardate 2261.34, according to Kirk's Captain's Log. He goes on to say that it's been several months since leaving Earth on the Enterprise's 5-year mission. But the stardate of 2261 indicates it is about two years after the events of Into Darkness (which took place in 2259), at the end of which the ship's 5-year mission was to begin. On page 7, Q remarks to Kirk, regarding the Enterprise, "...the design of this one is so much better than the beige look." He is referring to the beige coloring of most of the interiors of the Enterprise-D in the original timeline, though, since he is coming from the time of the Enterprise-E, which has far less beige, the comment is obviously more for the fans to chuckle at than to take as a comment on the current Enterprise. On page 9, three Klingon ships de-cloak around the Enterprise. In "The Khitomer Conflict" Parts 1-4, it seemed that neither the Klingons nor Romulans had yet achieved cloaking technology, though the Federation's Section 31 had. Of course, this turns out to be a test conjured up by Q, so he may have thrown in the cloaking capabilities himself. It's possible the Klingons have actually achieved it themselves as well, though only a couple of months have elapsed since the events at the conclusion of "The Khitomer Conflict" storyline on stardate 2261.168. The Klingon ships that surround the Enterprise on page 9 appear to be the same class as the part-Bird of Prey, part-Narada ones introduced in "After Darkness" Part 2. 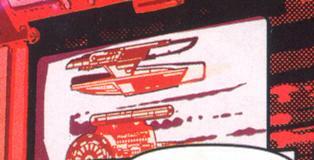 A schematic readout on Uhura's console of the Smallwood is seen on page 10. I've been unable to identify the exact class of Federation ship. It is similar, but not exact to the Oberth-class research ships. On page 11, Uhura realizes that "smallwood" in Japanese would be kobayashi. This is approximately correct, as kobayashi means "small forest". This refers to the no-win Kobayashi Maru scenario, which Q has brought to life in order to test Kirk in a manner similar to the Academy scenario. On page 13, Q materializes sitting in the captain's chair on the bridge. Kirk tells Q, "Get out my chair!" Captain Picard said the same thing to Q in the ST:TNG episode "Qpid". The scene of Kirk's death on pages 17-18 is from Into Darkness. On the last page of this issue, the Enterprise has emerged on the opposite side of the Alpha Quadrant and in the future, faced with space station Deep Space 9 and a contingent of Jem'Hadar battleships (seen mostly in episodes of ST: DS9).